Let it not be said that OTP doesn’t have its footsoldiers all over the globe. Well, at least in areas of the globe that have something to do with Ball State football. When I was a BSU season ticket holder, I anxiously awaited my large envelope with the actual tickets to arrive weeks before the season. It was the surest sign of all that football was right around the corner and my Saturdays were about to get considerably better. When that envelope finally landed on my desk and I unveiled the actual tickets, I was still excited, but not nearly as giddy as I could have been. The tickets, for lack of a better word, were…. plain. Maybe that was a metaphor for the program itself, just sort of floating along hoping no one noticed how average at best BSU was on the football field. The reason why the additional IU tickets are there are to show the different ones you may have. The foil around the outside of the ticket is determined by your seats. Season ticket holders get the silver. Club seats get the gold. Suite holders get the red. Creativity… we has it. 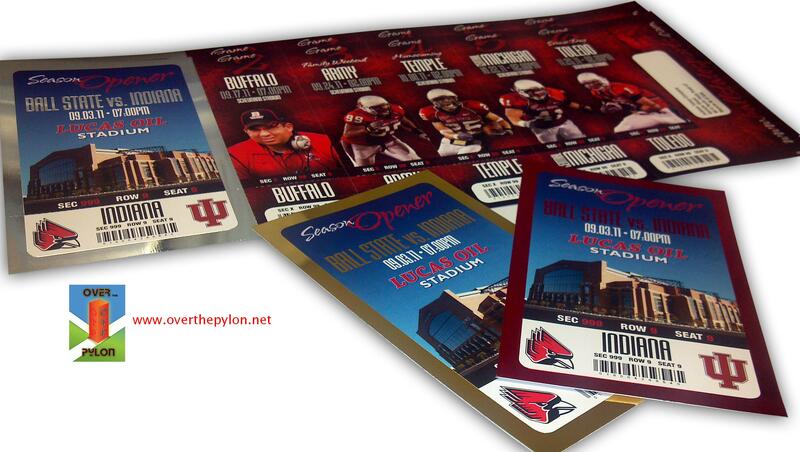 Nice to see Adam Morris, Sean Baker, Andrew Puthoff, and Briggs Orsbon on the tickets. I think most fans would agree that those four are some of the most critical this season, all are captains and all are seniors. When the captain announcement was made, Kreg Hunter was also listed, so it’s a little odd to not have him there. Perhaps this goes without saying, but those are dummy bar codes and seat assignments. Don’t try to use it to get in. After some digging, the company responsible for these is http://www.indianaticket.com/ should you find yourself in need of ordering tickets for things. Or other assorted goodies. Thoughts on the tickets? Count me in the “Love ’em” camp. Tickets look good! Let’s hope what shows up on the field looks equally good.